Your nonprofit has constituents, and just like every other nonprofit, you want to track data about them. From donors to clients to volunteers to advocates to alumni, and many other types, your organization would love to find a magic system that lets you track everything you want to know about each type of constituent, including every interaction and every conversation they’ve ever had with your staff—plus the ability to spit out exactly the right information whenever you need it. First, the bad news: That magical system is about as real as… well, magic. The good news? Though there’s no single system or even single type of system to support every nonprofit, there are a plethora of different types of constituent management systems, each with its own specific set of strengths and weaknesses that will overlap in various ways with the things you’re looking to support. Finding the system or systems that make sense for you is a matter of matching up the features with your needs within the context of other criteria, like your budget. But how do you start to think about what makes sense for you? The first step is to understand all the different types of systems and their general strengths and weaknesses. If you need something strong in tracking membership dues, event registration, and broadcast email, what types of systems should you look to? What if you need something with sophisticated functionality in tracking program delivery and outcomes? Or something that integrates all your online communications and transactions? While it might be tempting to say that you want all of those things in a single system, that’s not likely to be practical—at least not at an affordable price. To get a better grasp of your options, it’s critical to first understand the difference between generalist and specialist systems—in other words, between broad, shallow software and deep-targeted software. Think of it like fishing: You can toss a wide net, scoop it through the first few feet of water near the surface, and catch a lot of different fish, but then you miss a lot of the fish swimming at the deeper depths and the biggest ones at the bottom. That’s the idea of broad-reaching generalist software, like Constituent Relationship Management systems or online integrated tools. They cast wide nets to capture information about many different kinds of constituents, but typically don’t provide as much robust support for more-complicated transactions with any specific type of constituent. Alternatively, let’s say you really want to capture some of the big fish at the bottom. You can target them with a narrow, deep net—that gives you access to all those fish in that one spot, but you can’t capture all the other fish everywhere else. Deep-targeted specialty software like donor management or case management systems give you powerful tools to manage information and interact with constituents, but for the most part, they focus only on one type of constituent. Which type is better? That depends on your needs. If your organization prioritizes one or two types of constituents, you might be better served with one or two specialty tools like a donor management, client management, member management, or volunteer management system. 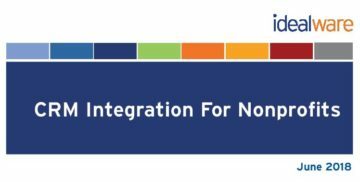 If you need to track interactions with a lot of different constituents but don’t need anything particularly robust in any one area, then a generalist Constituent Relationship Management or online integrated system might make more sense for you. Let’s look at the different types of systems one at a time to see what each does well. On the surface, these systems provide targeted support to track donors, prospects, pledges, premiums and giving levels, matching gifts, and sometimes even grants and corporate sponsorships. Most also allow you to mail-merge letters, create reports, or query to generate lists of donors. More sophisticated systems offer considerably more functionality for tracking different kinds of gifts—for example, grants, online gifts, major gifts, and planned gifts—and advanced features for determining who your best candidates for donations are and the steps required to cultivate them. But such systems also require more technical savvy from fundraisers and IT staff. 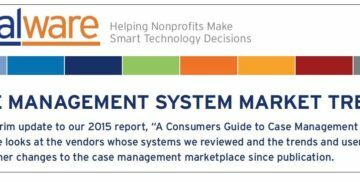 Increasingly, many systems include substantial functionality beyond core donor management. Some provide online payment functionality that could potentially replace online donation or event registration systems, and others offer email functionality (though it may not be as robust as even inexpensive broadcast email software). Some donor management systems move toward the realm of constituent relationship management and market themselves as full-fledged CRMs. These systems often provide reasonable functionality to track volunteers, event registrants, or other constituents in addition to donors, but are best-suited for organizations that hold individual fundraising as a top priority. There’s no shortage of these systems on the market. Inexpensive ones like GiftWorks, Blackbaud’s eTapestry, and DonorSnap start at under $1,000 per year. Mid-priced systems, like DonorPro, Blackbaud’s Raiser’s Edge, and Talisma Fundraising (formerly Donor2) can cost well over $10,000 to implement. At the high end of the spectrum you could easily spend $100,000 or more. If your organization provides specific information and benefits to dues-paying members, you might find an association management system useful. They tend to be strong at managing yearly dues, events, and online member interactions. More advanced systems often also provide substantial donor management support as well as such functions as broadcast email and online payments. Association management is generally synonymous with membership management, though it tends to imply a larger system that tracks both organizations and individuals as members. At the lower-end of the spectrum, less-expensive online tools like Wild Apricot, 123Signup, MemberClicks, and YourMembership.com, which recently merged with competitor Affiniscape, range from about $50 to $300 per month, depending on the specific tool and how many members you’re tracking. Mid-range tools (typically between $3,000 and $15,000 per year) offer deeper functionality and greater ability to configure the application to meet individual associations’ needs. Hosted solutions in this range—like i4a’s Association Management System and Avectra’s netFORUM—tend to provide lower startup cost and implementation time, but are somewhat less flexible. If you need more flexibility, consider solutions like JL Systems’ NOAH or Euclid Technology’s ClearVantage that provide both the systems and the consulting to tailor them to your needs. At the high end of the market, systems like Advanced Solutions International’s iMIS, GoMembers AMS, TCS Software’s Prevail, Aptify, and TMA Resources Personify systems target larger professional or trade associations that have the technical staff in place to adopt and sustain enterprise software. Case Management Systems—sometimes called Client Management Systems—will track the information you need to work with clients, such as age, address, job history, medical history, and child care situation. They’ll also track communications between your staff and clients as well as individualized plans for each client and the progress made toward those plans, and let you report on all the information you’ve collected—maybe even including overall program evaluation. Advanced case management systems can do even more, such as helping with workflow and scheduling. For instance, based on the information you enter about a client, they can recommend that client meet with a dietician, help schedule that meeting, and send the dietician a reminder. They can also help to automate your billing processes, particularly if you need to bill federal or local governments, programs like Medicare and Medicaid, or insurance companies. A number of systems are intended to work across a range of human service scenarios. At the lower-price end of the spectrum, systems such as ClientTrack and Social Solutions’ Efforts to Outcomes (ETO) can provide substantial tracking ability at about $3,000 to $25,000 per year. Somewhat more expensive software like Bowman Systems’ ServicePoint, Service Xpert Suite by Unicentric, or Evolv-CS by Netsmart can provide more power for more expense—about $20,000 to $50,000 per year. Large organizations will likely need to look beyond these tools toward more powerful and expensive solutions, a complex marketplace beyond the scope of this guide. 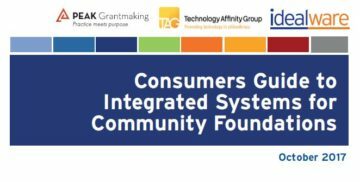 Organizations working in specific sectors like homelessness outreach, after-school programs, and the legal aid sector will find that there are systems are marketed directly to their needs. Do you work with a lot of volunteers, and track their hours, interests, schedules, and contributions? If you have very complicated scheduling needs or recruiting processes, it’s possible that a dedicated volunteer management tool like Volunteer Reporter, Samaritan eRecruiter/eCoordinator, or Volgistics will be helpful. These systems can track volunteer certifications, background checks, hours worked, and even assign time slots based on skills and availability—for example, every volunteer with a third-class driver’s license who is available Thursday afternoons. It’s important to think carefully, though, as to whether a system specifically devoted only to managing volunteers makes sense for you. Volunteers are frequently also donors, event attendees, or even clients as well, and other tools like donor or membership management systems may have basic-to-mid-level volunteer functionality. It’s worth giving a little thought to ensure that tracking volunteers in their own standalone system won’t create unnecessary data headaches. Constituent Relationship Management systems, or CRMs, are designed to track comprehensive data about each constituent—not only the donations and membership dues, but also potentially event attendance, volunteer work, and anything else you might care to track about a particular individual. These systems are not designed to specialize in any one specific function. Instead, they start with comparatively few features out-of-the-box and are quite flexible to let you tailor them to the processes you need to support. This means they can provide customized support to your precise needs, but will almost always require customization—usually done by a consultant—to support the interactions for your specific organization. There’s four particularly widely used CRM systems: CiviCRM, Salesforce, Microsoft Dynamics CRM, and SugarCRM. CiviCRM is always free and open source, while Salesforce provides nonprofits up to 10 free licenses. SugarCRM has a free, open-source community edition of the software, as well as editions requiring subscription fees that offer much more functionality. Microsoft Dynamics CRM offers a substantial nonprofit discount—for larger organizations, it may be less expensive than Salesforce. All of these systems are fairly affordable to acquire, or even free, but are likely to require significant upfront consulting fees—a couple thousand dollars at a minimum—to make them truly useful for your needs. CRMs tend to make sense for organizations that work with a broad set of interrelated constituents to provide a number of different services. If constituents have complicated relationships with your organization or tend to cross organizational boundaries—for example, program alumni often become donors—a CRM can be a useful way to get a full picture of each constituent. Online integrated systems combine different online functions in a single package. For example, they’ll often let you track donors and other constituents, send broadcast emails, take online donations and event registrations, and even manage a website—all in one system. Because all the online components are integrated, there’s no need to sync data between different components, which makes them compelling alternatives to using, for instance, standalone email, donation, and event registration tools. They can save you a lot of time and hassle by keeping all this data in one place, but make sure your other needs are also being met. These systems are also unlikely to be strong in every area they attempt to cover—look closely at each module to see how well it meets your needs. In particular, these online specialty tools often aren’t as strong at helping with direct mail processes and donor list-generation tasks as donor management systems. Prices for integrated tools vary dramatically depending on the number of constituents you track and the features and modules. Several tools, like Wild Apricot, Blackbaud’s eTapestry, and NeonCRM by Z2 Systems support up to a few hundred constituents for anywhere from free to $50 per month. Tools like MemberClicks, Salsa by SalsaLabs, CitySoft, and Artez provide more features for somewhat more expense. Antharia’s OneFish offers an integrated toolset with consulting help to implement it, and top-of-the-market software like Blackbaud’s (formerly Convio’s) Luminate provide rich toolsets for sizable nonprofits. What Type or Types of Systems are Right For You? Unfortunately, it’s unlikely that any of these systems will be the magical one that can handle all your constituent data needs. Unless your particular needs are both basic and very common, you’ll probably need to either customize a system to meet them, decide that some of your desires are not critical and you can live without features to support them, or use multiple constituent systems. Once you’ve defined whether you should be using one or two constituent systems—or even three, which is conceivable but unlikely—pick the type of system that comes closest to meeting each need. For instance, do your requirements most closely align with a donor management system, a case management system, or a CRM? Then think through ways to supplement it, if necessary. Can you customize it to extend the functionality? If you’re going to use multiple systems, do they overlap at all in the groups of constituents they track? If so, think through the possibilities for integrating them. You could plan to do so manually by exporting data from one program to an Excel spreadsheet, then use the other system’s import tool to pull that data from the spreadsheet, but you’d have to do this every time you wanted to sync information—which could be reasonable only if you don’t do it very often. Alternatively, you could invest up front to hire a skilled programmer to create an automatic connection between the two. Expect the cost for this to start around a couple of thousand dollars. It will also require both software packages to be integrated to have the functionality necessarily to automatically get data in and out. If you think you might go down this path, make sure you check on the availability of automatic data insertion and extraction tools before you purchase a new piece of software. As you’re working through this whole process of picking a type of system, resist the temptation to hold out for a magical perfect system—remember, what looks like magic is really an illusion. Instead, focus on finding the system or systems that come closest to meeting your requirements. The truth is, the different types of constituent databases aren’t as distinct as they might seem—for instance, some offer a lot of support for donor management, the ability to track members and volunteers, considerable flexibility to track other constituents, and some support for broadcast email and online donations—and it’s likely that you’ll be able to find the system or combination that works for you. Will it be a donor, member, volunteer, integrated online, or CRM system? It doesn’t matter, as long as it meets your needs. Thanks to TechSoup for providing the financial support for this article.